eg. Ranking SVM, RankBoost, RankNet, etc. Direct optimization of IR measure: AdaRank, SVM-MAP, SoftRank, LambdaRank, etc. Listwise loss minimization: RankCosine, ListNet, etc. Joachims, T. (2002). Optimizing Search Engines using Clickthrough Data, 1–10. Zhai and La erty (2004) Zhai, C. and J. La erty (2004). A study of smoothing methods for language models applied to information retrieval. ACM Trans. on In- formation Systems 22(2), 179–214. Burges, C. J., T. Shaked, E. Renshaw, A. Lazier, M. Deeds, N. Hamilton, and G. Hullender (2005). 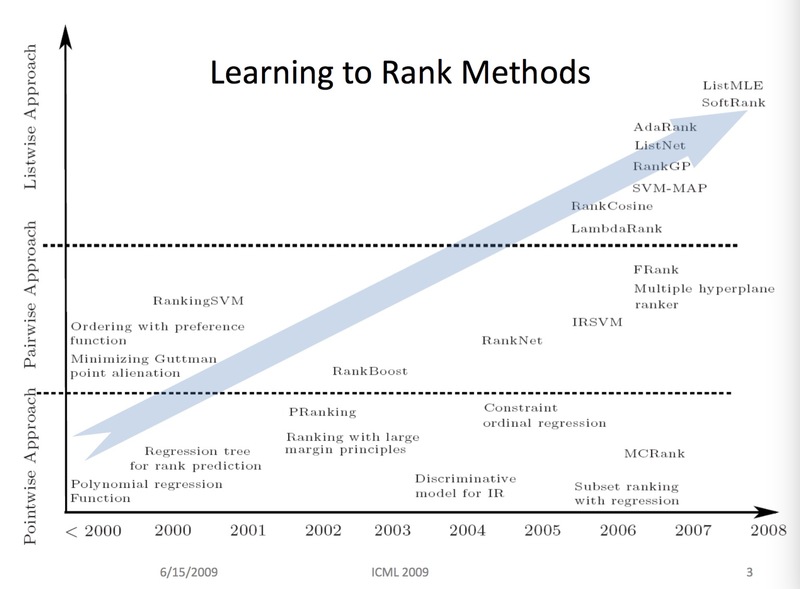 Learning to rank using gradient descent. In Intl. Conf. on Machine Learning, pp. 89–96. Burges, C. (2007). Learning to Rank with Nonsmooth Cost Functions, 1–8. Learning, pp. 129âA ̆S ̧136. Xia, F. (2008). Listwise Approach to Learning to Rank - Theory and Algorithm, 1–8. Carterette, B., P. Bennett, D. Chicker- ing, and S. Dumais (2008). Here or There: Preference Judgments for Relevance. In Proc. ECIR. Liu, T.-Y. (2009). Learning to rank for information retrieval. Founda- tions and Trends in Information Retrieval 3(3), 225–331. Usunier, N., D. Bu oni, and P. Galli- nari (2009). Ranking with ordered weighted pairwise classification. Zhang, X., T. Graepel, and R. Herbrich (2010). Bayesian Online Learning for Multi-label and Multi-variate Performance Measures. In AI/Statis- tics. Zheng, Z. (2016). A Regression Framework for Learning Ranking Functions Using Relative Relevance Judgments, 1–8.